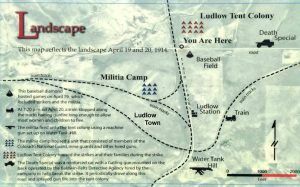 On Sunday, April 19, 1914, it was a temperate spring day at Ludlow, where much of the camp enjoyed a celebration of the Greek Orthodox Easter, which included a community dinner, musical entertainment, and a baseball game. At one point, a small group of Guardsmen entered the field and exchanged verbal taunts with the relaxing strikers, with one soldier threatening the colonists a “roast” from the National Guardsmen. Later, these words seemed to the strikers to be evidence of a planned attack. On the next day, April 20, a woman arrived by train at the Ludlow depot and told a National Guard officer that she wanted to see her husband at the Ludlow Colony. Two Guardsmen were dispatched to the camp and were told by Louis Tikas, who was in charge of the colony in John Lawson’s absence, that there was no such person in the tent colony. The soldiers accused him of lying and threatened to return in greater numbers to search the camp. The soldiers then returned to the depot and reported the events to their commander, Major Patrick J. Hamrock, who telephoned Louis Tikas requesting a meeting to discuss the matter. However, when Tikas refused his request, Hamrock responded by ordering a detachment of troops to take up a position and undertake drills on Water Tank Hill, a strategic elevation located about ¾ of a mile south of the tent colony. Back in the tent camp, a group of strikers agitated by the soldiers’ visit, congregated around Tikas and argued in favor of armed resistance to any further attempt by Guardsmen to enter and search the colony. After calming the miners, Tikas decided to meet Major Hamrock at the Ludlow depot. Noticing groups of men moving about the tent camp, Major Hamrock ordered a machine gun to be taken to Water Tank Hill. As Tikas and Hamrock discussed the situation at the depot, the first National Guard troops arrived on the hill. Three women, who had been at the depot and saw the troops occupying the position, returned to the tent colony and informed the striking miners of this development. 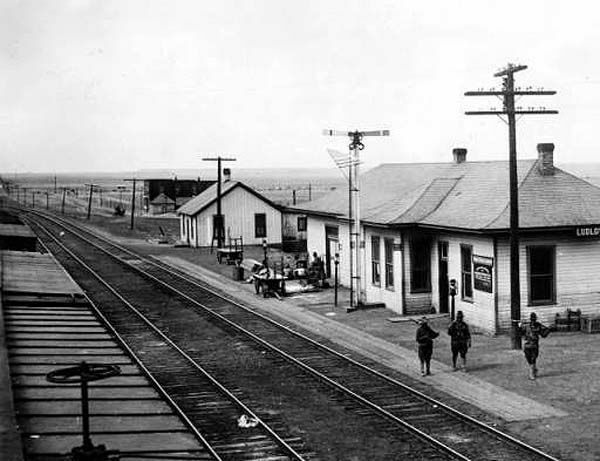 Viewing the National Guard maneuvers as a threat, some 35-50 armed Greek strikers began moving from the tent colony to a position in the Colorado & Southeastern Railroad cut a few hundred yards to the southeast. Other groups within the camp started moving northwest toward Del Agua Arroyo and the Colorado & Southern Railway bridge. 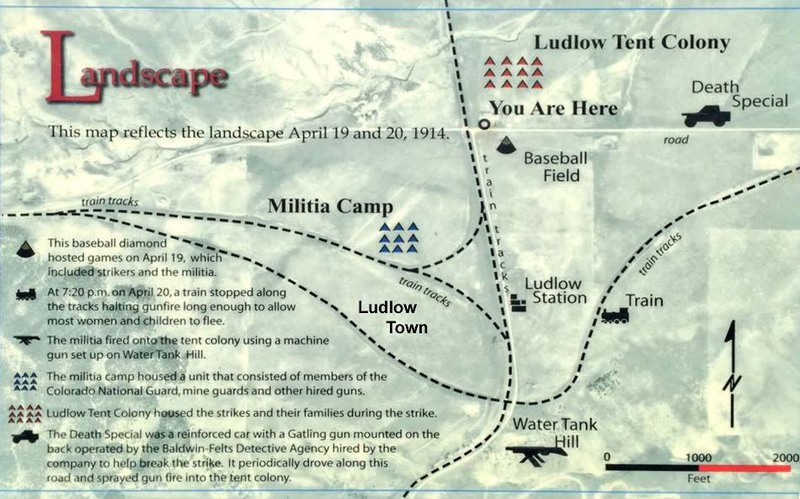 Observing the strikers’ actions, Louis Tikas ran from Ludlow depot toward the camp waving a white handkerchief in an attempt to get the men to return to the colony, but events were already out of hand. Major Hamrock, who viewed the movements of the armed strikers as ominous, directed his troops to take battle positions on Water Tank Hill. He then ordered the detonation of two dynamite bombs to signal other troops in the area of imminent combat. The explosions were interpreted by the strikers as an attack and a general exchange of gunfire between the National Guard and the strikers ensued. It was never determined which side fired the first shots, but the long-wearing months-long standoff and the atmosphere of mutual distrust, made the conflict almost inevitable. Both sides were convinced that the other was guilty of precipitating the gunfire. The National Guard troops, along with mine guards and other mine employees numbered a force of about 177 men who were armed with Springfield rifles and at least two machine guns. While more numerous, the strikers were more lightly armed. As the bullets blazed overhead, many of the women and children were hidden in pits beneath their tents. Some fled for the safety of the arroyo north of the camp and others to homes and ranches in the area known to be owned by union sympathizers. 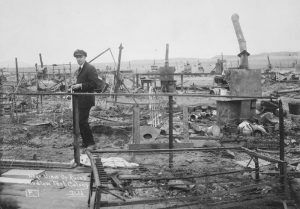 The next morning, the sun shined bright on the scene of the battle where metal objects, such as cast iron stoves and stovepipes, bed frames, and washtubs stood out in the otherwise flat plain of blackened debris. Yet, this tragedy didn’t end the war. For the next ten days fighting continued in the area as outraged men crowded the union office in Trinidad demanding arms “to work vengeance upon the militia, whom they hold responsible for the destruction of their homes and the death of their women and children.” In Denver, the State Federation of Labor issued a call for their men to organize, arm, and send help to the strikers. 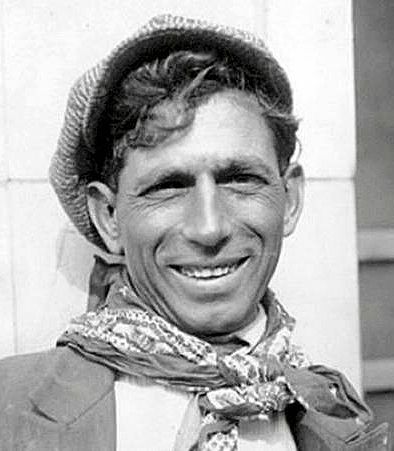 Enraged miners dispensed with words and took direct action against the operators, attacking and damaging mines and associated facilities and fighting with company guards and state troops over a 40-mile front from Trinidad to Walsenburg. 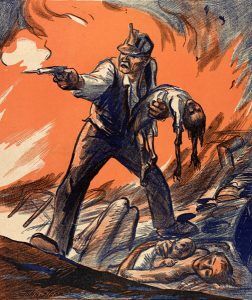 In what became known as the “Ten Days War,” the full-fledged rebellion included attacking mining camps and anti-union establishments, looting stores, shooting at mine guards and troops, and holding mine employees hostage. Adjutant General Chase then assumed personal charge of the entire strike district, instructing his men not to fire on miners unless they were attacked. Troop E, which consisted of 47 recruits, mostly former coal company employees, was relieved of duty. In the meantime, a big tent colony was established in the San Rafael Heights area of Trinidad to house the homeless people from Ludlow, the union provided food and bedding for refugees, and the Trinidad Trades Assembly Hall was converted into a dormitory and hospital, since many of the homeless survivors suffered from burns and other injuries.